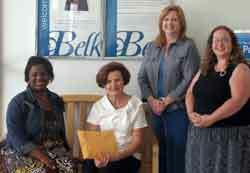 From left, Kim Jones, store manager of Belk in Fayetteville; Karen Spangler, CARE (Children at Risk in Education) coordinator; Julia Simpson, after school program director; and Cheryl Bellinger, human resources manager of Belk in Fayetteville. Struggling families will be able to get some assistance with after school care this school year thanks to those who bought tickets to the Belk Store Charity Sale in May. Over $1,200 was raised for the Fayette County Public School System’s After School Program. The proceeds will help offset after school scholarships for 80 needy children. The scholarships are for working families who have had financial reversals due to unforeseen circumstances such as medial, environmental or family emergencies. Families who meet the requirements for the free and reduced lunch program may apply for scholarships. Recipients are required to pay 25 percent of the after school program tuition. Belk’s Charity Sale is held twice a year, providing an opportunity for local organizations to raise money and educate the community about their services. In exchange for a $5 donation, customers receive a ticket admitting them to the sale and entitling them to merchandise discounts. Proceeds from the ticket sales are retained by the charities.